My wife and I both have old phones (mine has an elastic which holds the almost dead-battery on [see photo below]) and have been thinking about getting new ones. We didn’t want to get a contract and haven’t had time to look around for a good deal. Luckily, staff writer “Henry” took the time to do a rather extensive analysis recently on cell phone deals and concluded that for the light user, the 7-11 deal is the way to go. The Nokia 5130 is basically the new Four Pillars staff phone since Mr. Cheap, myself and my wife all went out and bought one after reading Henry’s post. I like my phone so far – I love how it can take pictures although I have no idea how to get the pictures onto my computer. [edit – I figured it out] The drawback of this phone is that unlike my old phone it doesn’t fold up so it is a bit bigger than I am used to. I still can’t believe 7-11 sells anything other than beef jerkey and over-sized pops but as it turns out – they sell pretty good cell phones as well. Basically they have 5 phones you can buy. If you get $100 of airtime then the phones are half price until Sep 30/2009. For the $100 you get 452 minutes which last for 1 year. Addition minutes are 20 cents per minute which is pretty good. On these phones you get voice mail, caller ID, call waiting and 3-way calling. I was talking to Mr. Cheap the other night and he tells me that there is even a video recorder on the phone. I can’t imagine how unbelievably crappy the video picture must be, but hey…if Santa Claus shows up and you don’t have time to get your real camera then it will have to do. The phones range in price from $59 ($29.50 on sale) for the basic Nokia 1661 to $140 ($70 on sale) for the 5130 which has an mp3 player and 2mb camera. 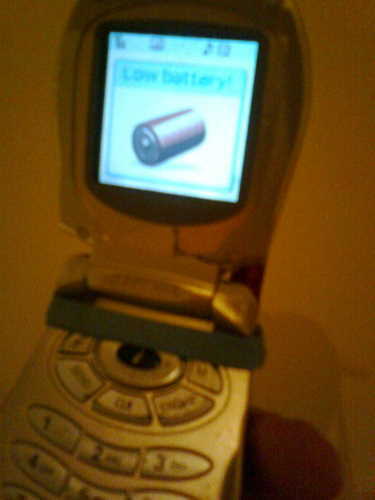 My old phone - note the rubber band holding the battery on as well as the cracked casing (just below the screen). The battery needed replacing as well. If you don’t use all of your 452 minutes in the first year then you can keep those minutes active by buying more minutes before the old ones expire. They can be purchased in blocks of $25 (for 100 minutes) /$50/$75 or $100. Once you buy more minutes, ALL the minutes on your phone (the old ones and the new ones) now have an expiry date of 365 days from the top-up date. The camera in this phone is no substitute for a proper digital camera however it can take reasonable photos in the right conditions (apparently not indoors as you can see from the pics so far) and makes a satisfying “camera taking picture” noise when using it. 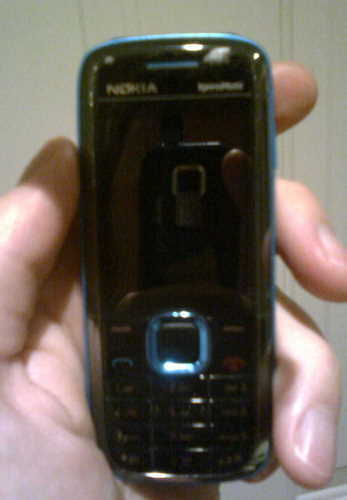 If you buy the phone then you will need to go to the Nokia support site in order to download the proper software. When you get to the page choose your phone (you can move the green thingy below the phones to show more phones). You have to download the “PC Suite”. It takes a while to do all the downloads and is a royal PITA in my opinion. In fact I think you could probably download several versions of Window in the time it took to get this Nokia software installed. Once I figured everything out then it worked really well. You can select a default download folder so from then on – anytime you connect the phone it will download there. You can select a subfolder based on the download date or picture date or other options. The photos shown so far in the post look like crap. This phone camera does not work very well indoors – which is ok since you’ll probably have your normal camera available. 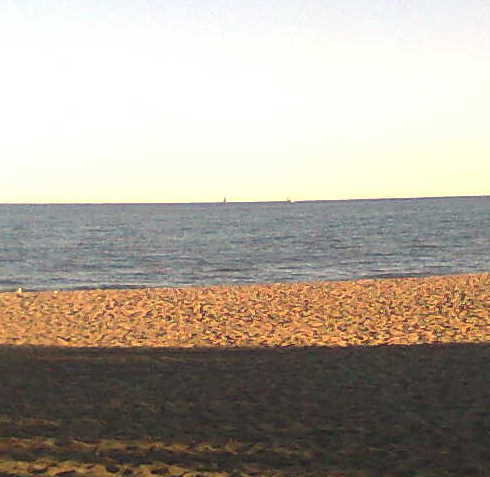 Here is a photo taken from the phone down at Ashbridges Bay which looks a bit better. It’s pretty good for taking pictures of people outdoors. I’ve been looking at options for porting to from Virgin Mobile Canada, which isn’t the deal it once was for light use. I’m thinking 7-11 might work best for me. Squawk – Glad you like it. Carl – Thanks, I meant to link to that site. I’m surprised that 7-11 doesn’t go after them for trademark issues. Technically speaking, cell phones will never be able to have the same picture quality of a regular digital camera. The quality of a photo is dependent on size of the lens especially in the dark. This is also the reason why SLR cameras have better quality photos than regular digital camera. Most cell phone camera lenses are very, very small. I am not aware at this point of a cell phone that has a significantly better camera than Nokia 5130 at $70 retail price range. If you are looking for a cell phone that has a good camera, it might be worth it to pay 200 USD extra to get an unlocked phone in US or elsewhere. I have Nokia N95 with Rogers subsidy and it has a great cell phone camera: 5 megapixels with a medium sized Carl Zeiss Lens and zenon light. When I have my N95, I find that I do not need a regular digital camera. N95 is mediocre for taking night photos and I wish I can afford a SLR camera. N95 is at least $400 without subsidies and you can buy a SLR camera with $400. Mike, I think speakout currently offers a referral bonus for extra minutes. Might be something that would be beneficial for you and your readers. If anyone wants to do the referral then let me know and I’ll set you up with Henry since he’s been doing referrals. My usual disclaimer about Speakout: You can’t use text message short codes like 46645 for google, 33333 for Vancouver bus schedules, 21212 for Twitter. To me this is a deal breaker. Charles: I have never used a short code before. Thank you for the information. I’ve never heard of ‘short codes” before – what are they? If you are a light user for cellphone, then you don’t need short codes text messages. My understanding: Short codes are services (free or not) offered by companies to send you information by text message after you send them a message (typically to a 5-digit number, short code). For example, get free bus schedules in Vancouver or Montreal by sending a text message with information about the stop/line you want schedule. If you are a light user, I don’t see why you would be the type of person to want to use this type of service. They seem more oriented towards people that are on their cellphone a LOT. I have a Telus retention deal that allows me not to have a home line (no kids, so only 2 adults in appartment, each with a cellphone), so 7-11 would not be good for me, but it seems like a very good deal for light users. As a no-car transit user in the lovely city of Vancouver, where our transit authority has irrationally decided to stop posting paper schedules at bus stops, I would argue that even light users here have an interest in using short codes here. No short codes = no bus times without using voice minutes = deal breaker. Cash Instinct: I use Roger retention plan. I think most people do need a monthly plan unless they have access to a landline most of the time. missnb20: PC mobile is interesting where PC mobile network calling and texting is $7 a month. I prefer 7-11 GSM phones to PC mobile CDMA phones. ethan: Good for you. If you need a new phone, do look into Nokia 5130. Charles in Vancouver: I never knew that before. 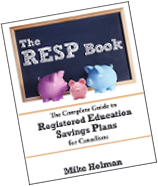 It sounds like that a retention plan might be the best for you to get more minutes and free text messages. i was just told by speakout wireless that unless i buy a $50 or $100 dollar top off card my minutes would expire in a month. i hve to buy 50 or 100 dollars for it to last a year 365 days. she said speakout changed the plan in april of this year. i did’nt know that!!!!! i wish the company would inform their customers of any changes.!!!! For light user, I’d recommend TracFone. They’re very reliable as the company has been around for quite some time. My mom has been with TracFone going on 2 years now and she has no complains. The reception is clear and so inexpensive (average less than $7 a month) that I can afford to pay for her bills. Great for her but would never work for me as I live on my phone so only ones with unlimited plan would do for me. “Get airtime that lasts a long time. Says it again Nick. So looks like your info was too much trust in a cs rep.
Next post: Ohio Unemployment Benefits Extension – 13 More Weeks?